Margaret Thatcher's dead at last, and the pictures that crowd in speak of war and confrontation: riot police on horseback bringing their batons down on the heads of striking miners; cars in flames in Trafalgar Square during the poll tax riots; riots in Brixton and Toxteth against racist policing; US cruise missiles nestled behind the fence at Greenham Common; the infamous Sun headline—GOTCHA—when the Argentine cruiser Belgrano was sunk outside the Falklands exclusion zone; the ten IRA hunger strikers for political status dead in the Maze prison; the IRA bomb that almost killed Thatcher herself in Brighton. Hard on their heels come images of polished domestic smoothness: the handkerchief dropped disapprovingly on the tail of a model plane that bore no Union Jack; the helmet of bright hair; the handbag, sign of female thrift and household management, of the grocer's shop at Grantham gone terrifyingly global. The slide shows are two sides of the same coin: it's partly because Margaret Thatcher was a woman that she was able to drive through her relentless war on the unions, the working class, the welfare state, the left. Her eleven years as prime minister tore Britain apart, dead-ended lives, decimated industries and starved communities, made greed a virtue and indifference a mark of maturity. Her ruthlessness came coated in a lethal emollient: the soothing voice, the honeyed firmness of the nursery. She was the first British leader built for TV, a male fantasy of forceful femininity. She was also, in many ways, Britain's first American leader (the second was Tony Blair), although she would have hated to be so described. 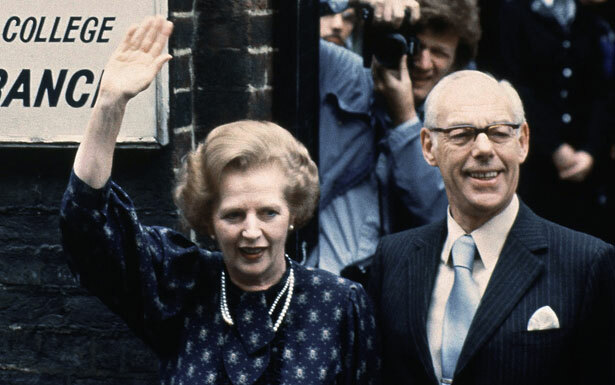 When she became prime minister in 1979, Britain was a crumbling post-imperial power, battered by globalization and the oil crisis, stalled by waves of strikes as unions fought to hold on to their piece of a shrinking pie. Sweeping aside the postwar consensus for a mixed economy and a universal welfare state, Thatcher used the revenues from North Sea oil to squeeze the public sector and fund a radical restructuring, lowering taxes, privatizing public assets from water to electricity to council houses, tearing down protections (in her view, obstacles) against market forces. Unemployment rose to nearly 12 percent, the highest it had been since the 1930s. Deindustrialization had already begun; she speeded it up deliberately, without a care for the lives being ruined in the process, with the barely disguised intent of destroying the labor movement. "And you know," she famously said, "there's no such thing as society. There are individual men and women and there are families. And no government can do anything except through people, and people must look after themselves first." We are all Thatcher's children now, in Britain and in Europe, where the austerity policies she road-tested in the 1980s are being applied as if there is no alternative and no tomorrow; now Germany's Angela Merkel is the lady not for turning. In the week before Thatcher's death, Britain saw deep welfare cuts—deeper than any Thatcher achieved—with tax cuts for top earners. The language of "skivers versus strivers" in which the Tory party has framed this debate would have been political poison before the 1980s, when Thatcher and Ronald Reagan whipped up resentment of "welfare queens" and welfare dependency. New Labour, Thatcher's greatest success, firmly hammered home her counterrevolution, chiseling at the principle of universal provision in health and education, reducing class mobility, cutting child poverty but widening the gap between the lowest and the highest earners. Privatization, discipline, austerity in recession, deregulated banks, kill-or-cure remedies: in so many ways, Thatcherism is the new normal. Maria Margaronis writes from The Nation's London bureau.